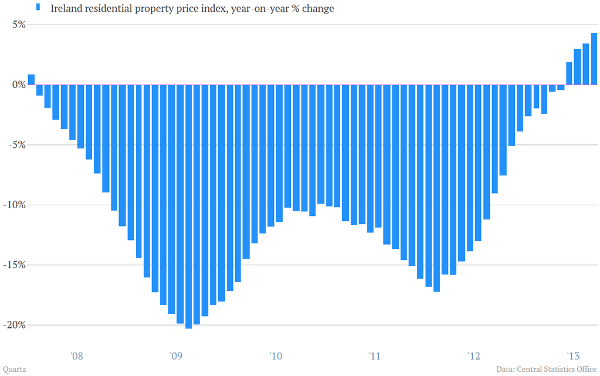 Here’s a graph showing the year on year change in Irish property prices, based on the latest Central Statistics Office statistics. You can examine the raw data on the CSO website, in an article headlined Residential Property Prices rise by 3.6% in the year to September. It’s a heartwarming image. 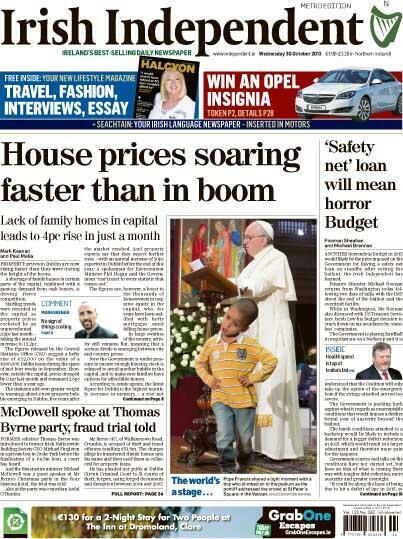 Glance at it without too much thought, and you might form the impression that house prices are on the up. We’ve recovered the value lost during the propertry crash. We’re on the right track. We’ve turned the corner. The best is yet to come. Except the vertical axis doesn’t measure house prices, it measures the percentage change in house prices over the past twelve months. Here’s the same information, presented in a different form. This time, the vertical axis represents the change from values in a base year, not the year on year change in prices. The blue line represents house prices nationally. 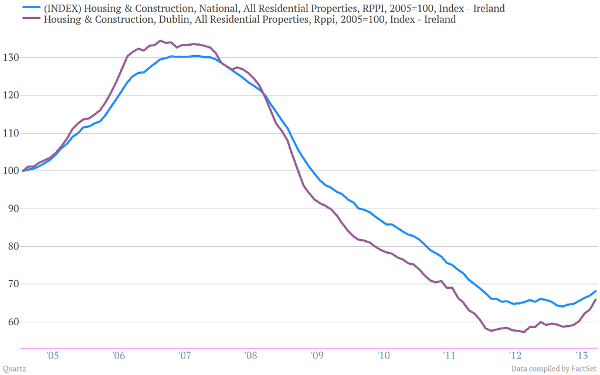 The purple line represents house prices in Dublin. Now there is some good news there if you’re hoping for a housing price recovery. Granted, its not as cheery as in the first graph. But is is more honest. So what do you think Irish newspapers are reporting today? Also, the % change narrative hide the fact that the numbers of sales is shrinking in Dublin.